Whales are among the most majestic creatures that one can encounter in the wild. The opportunity to go and visit with them up close is something everyone should take the opportunity to do at least once in their lifetime. My opportunity came during a breezy day during the middle of summer here in New England. The morning was dry and sunny, a rarity during Boston's summers, which are known for being hot, muggy, and fairly unpleasant. My wife and I had made the decision the night before that we would be taking the motorcycle down, intending to stop and grab some brunch along the way before arriving in Barnstable to board our boat. However, a confluence of factors delayed our departure and the unanticipated crush of traffic as we neared the Cape created further delay. By the time we had arrived at our brunch destination, they had shut down brunch service and would be not seating for lunch for another hour. Hungry and a little worn down from the heat, we quickly searched for options near the harbor where we would be boarding our whale watch boat and hopped back on the bike to try to make up for lost time. Now that we were out of the heaviest traffic trying to get to the Cape, I had a chance to actually enjoy the windy roads that connect many of the little town along the north shore of Cape Cod. The narrow highway was lined on both sides with large trees that provided a much needed respite from the suns rays that had been beating down upon us on the way down from Boston. The road itself is smooth and well maintained, making this section of the ride the most enjoyable, yet. Unfortunately, it was all too short as we quickly arrived in Barnstable and found ourselves tromping through a gravel lot, the big Beemer perched somewhat precariously on its side stand. Stopping in for a quick lunch at the little seafood shack adjacent to the parking lot, we grabbed our stuff and hopped on the boat. Pulling out into Cape Cod Bay, the stiff sea breeze felt good after nearly two hours hunched over a hot engine in the bright summer sun. The boat was careful exiting the shallow waters, but accelerated up to full speed as soon as the emerald green surrounding us had turned into a a deep imperial blue. Despite the wind, the water was actually surprisingly calm and before too long, we saw Provincetown, the very tip of the Cape, passing to our right. 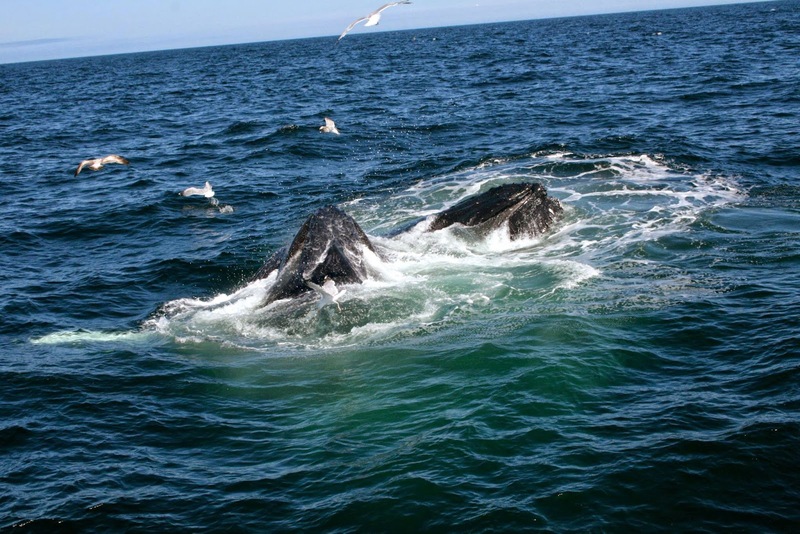 The intended destination was Stellwagen Bank National Marine Sanctuary, an area near the tip of Cape Cod where the migrating whales frequently stop to feed. Reports from other boats that morning had already reported lots of activity so everyone on board was giddy with anticipation, fingers crossed that the first sighting was only moments away. It did not take long for a string of gasps and shrieks of delight to erupt from one side of the boat as the first spout of water broke the surface of the water off in the distance. The boat changed heading and lumbered over there, bobbing along slowly in order to make sure there was plenty of time to maneuver should one of the whales decide that it wanted to change direction. As we crept closer, the spouts of water became bigger and soon, enormous shadows became visible under the surface of the water, punctuated by bursts of bright blue-green where the whales coloration was lighter. 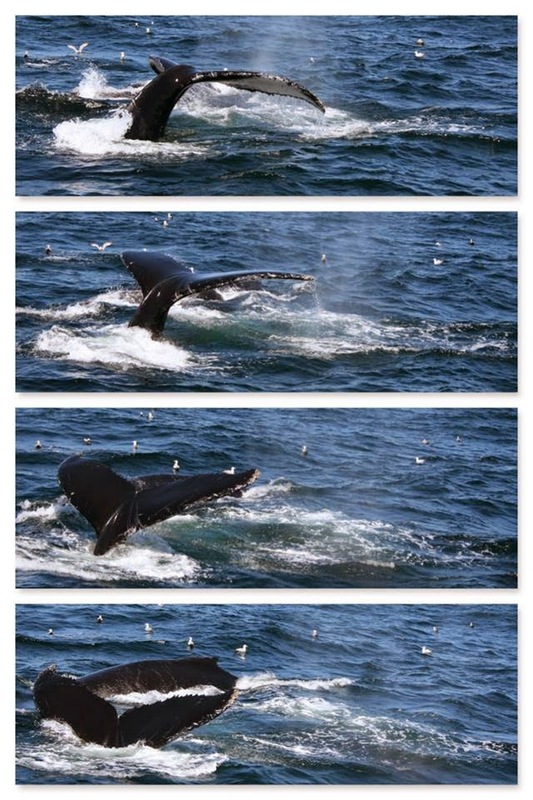 Suddenly, it became like a game of whack-a-mole as whales began making appearances all around the boat. Every couple of minutes, a whale would approach the surface to breathe, spraying a huge spout into the air as its blowhole cleared the surface, then arching its back and diving back down into water, leaving behind a a dark spot in the water that looks like an oil slick, but is simply an illusion created by the whale's motion as it uses its powerful body to dive. Occasionally, a fluke would pop up at the last minute, almost as if the massive creatures were acknowledging our presence by waving to us. Most of the whales visible in our immediate vicinity were fin whales, the second largest species of whale after the blue whale. Moments later, we stumbled upon an even rarer sight, a pod of dolphins racing along the water. The had been hanging around with the whales and were now playfully chasing some of the other whale watch boats around. This particular pod had several very young dolphins hanging close to their mother's side as they leapt through the air together. The massive pod gracefully bounded all over, moving much faster than the boats were allowed to travel with all of the wildlife in the water. At one point, we happened across a lazy humpback whale that appeared to be napping in the afternoon sun. The outline of its massive body was just barely visible under the water as we approached. At one point, we were close enough to clearly make out each breath as the blowhole on top of its body opened and closed. Unperturbed by our presence, the giant rested and soaked up the attention and admiration in addition to the suns rays. Leaving the resting whale to be, we began the trek back into Cape Cod Bay. Of course, we had one final visitor before the day was done. Off in the distance, a silvery patch seemed to be gliding across the water towards us, slowly making its way over the surface of the water. At first, people were unsure of what it was, but before too long, the outline of a giant ocean sunfish took shape. This goofy creature was flopped over onto its side on the surface of the water, just gently cruising by. The trip back was otherwise uneventful as the captain pushed the engines to full speed and raced us back. Pulling into Barnstable Harbor, we were exhausted, but elated to have had the experience. Being able to experience the majesty of the whales and see all of the other forms of marine life gave us a new found appreciation for the biodiversity of our oceans. It is one thing to watch the marine life on television, but a totally different experience to view them up close in their natural habitat. On the ride back into Boston, the setting sun off in the distance, we reflected upon our good fortune to be able to enjoy this experience and contemplated the things we could do in our lives to help ensure that whales, dolphins, and especially that goofy sunfish, would be around for many more generations to be able to observe and enjoy. While this was the first whale watch trip we went on, we have since been back again and the experience continues to be unparalleled. 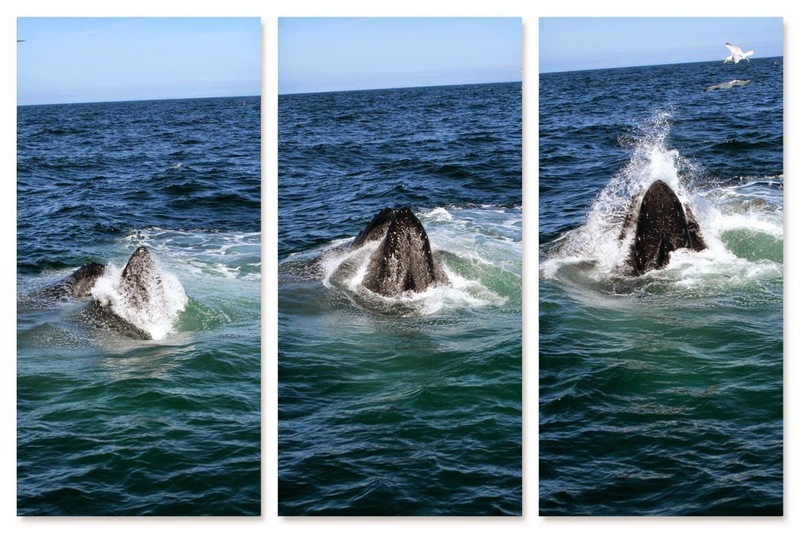 Special thanks to Hyannis Whale Watcher Cruises for both the exceptional experience as well as their efforts to increase aware of the diversity of our oceans. You can visit them and book your own whale watching excursion at www.whales.net. NOTE: The video included in this article is from the trip detailed in this article, but the images are from a subsequent whale watch trip and features primarily humpback whales. Click on any of the whale images to see the full gallery of photos.